"If I was him I'd retire too." Just days ago, UFC superstar Conor McGregor made an appearance at Binny's Beverage Depot in Chicago, where he spoke about the need to finish his trilogy with Nate Diaz, and why "there must be a rematch" against Khabib Nurmagomedov. So forgive me if I'm not sold on his latest "retirement" announcement. McGregor, 30, posted the following on his twitter account early Tuesday morning. Remember, McGregor pulled a similar stunt in April 2016 when he tweeted, "I have decided to retire young. Thanks for the cheese. Catch ya's later." As we know, he had a change of heart and was back in the octagon for a rematch against Diaz just four months later, so it's reasonable to believe he'll be "unretiring" once again in the near future. 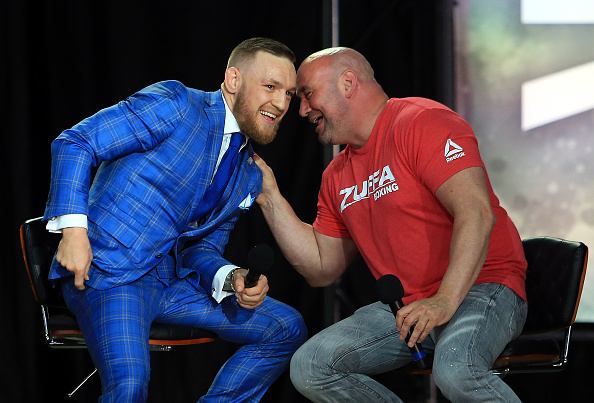 That said, UFC President Dana White seems to think McGregor is serious this time around. Or maybe he's just playing into the shtick. According to ESPN's Brett Okamoto, White texted the following after McGregor's unexpected announcement. "He has the money to retire and his whiskey is KILLIN it. It totally makes sense. If I was him I'd retire too." "He's retiring from fighting. He's not retiring from working. The whiskey will keep him busy and I'm sure he has other things he's working on." McGregor currently ranks as #3 overall in the Lightweight division behind only Tony Ferguson and the undefeated champion Khabib. For his career, thus far, he boasts a record of 21-4 with 18 wins via knockout and four first round finishes.